What is the small square item on the wall in the direction the pistol is pointed? That small square item on the wall is a playing card. This image demonstrates a popular 18th century magic effect in which a conjurer shoots the selected playing card onto the wall from within the shuffled deck. The selected card, in this case, appears to be a four of hearts is attached to the wall with what appears to be a tack or nail which would have been shot from the pistol. What seems odd in this image is the fact that a full deck of cards still appears on the table. In the card on the wall magic effect, the remaining cards should be scattered on the floor since they had just been thrown in the air. We could assume that the conjurer has two decks of cards, but there is no sign of any cards on the floor. 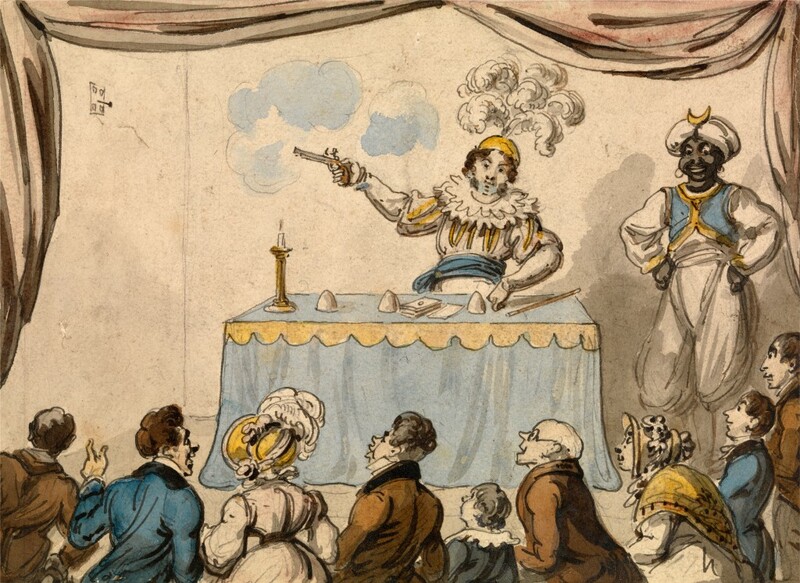 According to the artist, George Cruikshank, this image was made for the illustration of a book entitled “The Conjurer Unmasked” by Henri Decremps which attempted to expose the popular magic tricks of period magicians, including Giuseppe Pinetti.